The state Health Department has received $120,000 in federal funds to prevent one of Hawaii's costliest medical problems: Injuries. Each week in Hawaii, 11 residents die from an injury, 160 are hospitalized and about 1,200 are treated in emergency departments, the health department said. Injuries account for more than 10 percent of all medical expenses in Hawaii -- $117 billion annually -- and injury-related hospitalizations cost an estimated $340 million annually. The Centers for Disease Control and Prevention awarded the money to improve injury prevention control activities and the state's injury tracking capabilities. Information about traumatic brain injury, drowning, motor vehicle injury, poisoning, homicide, suicide and falls will be collected from hospital and vital statistics data and analyzed for use in developing injury prevention plans. Information about injury and violence prevention and control programs or activities and also about traumatic brain injury in Hawaii can be found at: www.hawaii.gov/health/healthy-lifestyles/injury-prevention/index.html. Brenda Davis, past chairwoman of the Vegetarian Nutrition Dietetic Practice Group of the American Dietetic Association, will speak on "Eating for Life" at a free meeting 7 p.m. Oct. 22 at McCoy Pavilion, Ala Moana Beach Park. Davis will discuss the consequences of food choices to human health and ways to modify diets to minimize disease risks. She will describe the dietary items posing the greatest threats to health and offering the most protection. She is the author of five books, including "Becoming Vegetarian" and "Becoming Vegan." For more information, call the Vegetarian Society of Hawaii at 944-8344 or see VSH.org. The Hawaii Perinatal Bereavement Network will hold its annual memorial event from 7 to 8 p.m. Nov. 1 at Tripler Army Medical Center Chapel. The program is free and open to all family members who have experienced loss of a pregnancy or death of an infant. A candle-lighting ceremony will bring families together to share similar experiences. A guest speaker, special music and refreshments will be available. For more information, call Cindy Nachtigall at 433-6606 or e-mail: cynthia.nachtigall@haw.tamc.amedd.army.mil. Police closed the H-1 Freeway in the east-bound direction between Middle Street and Hickam Air Force Base at about 8:30 last night after a man barricaded himself with a gun in a room at the Best Western Plaza Hotel on Nimitz Highway. Police said at least two shots were fired in an 11th floor room facing the freeway. The closure was expected to affect people returning to town from the University of Hawaii football game at Aloha Stadium. Guests at the hotel were evacuated from the building while a police SWAT team secured the area and negotiators attempted to get the man to surrender. Some guests staying below the ninth floor were allowed to return at about 10 p.m. The 51-year-old man was reported missing Wednesday. An officer investigating a tip found the man in the room with a gun to his head at about 5:30 p.m.
A 38-year-old man who fled after attempting to walk off with a cartload of merchandise from Times Super Market in Kahala Thursday night was arrested about two hours later when he returned to claim the cart, police said. The man caught the attention of store employees when they noticed his cart was loaded with cigarettes from a locked display case, police said. He walked out of the store about 10 p.m. with $1,300 worth of merchandise but fled without the cart when the employees tried to stop him, police said. Store management called police when the man returned to claim the cart. An early morning fire destroyed a Kaimuki house yesterday, leaving three people homeless and causing $200,000 in damage. Dayna Collier, a friend of the house's owner, scavenged burned boards and nailed the entrance shut to prevent people from entering after she said she saw people snooping around the charred remains. An early-morning fire destroyed a Kaimuki house yesterday and left three people homeless, a Honolulu Fire Department spokesman said. Fire Capt. 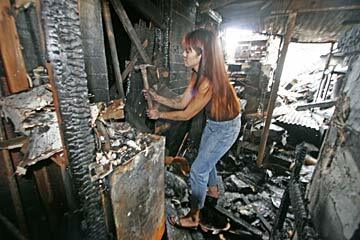 Emmitt Kane said the fire started about 1:30 a.m. at 853 Hauoli St. and was extinguished within 30 minutes. An elderly man was home at the time of the fire, but escaped without injury. Kane said the fire was difficult to fight because the two-story home had "an accumulation of stuff," including several canisters of gasoline. Damage is estimated at about $200,000 to the home and its contents and at about $18,000 to neighboring homes. A 33-year-old Kailua man captured a suspect who allegedly was breaking into a car parked outside his house early yesterday morning. Police said the man awoke upon hearing noises outside his home at 405 Keaniani St. He ran out and discovered a man rifling through his car, police said. The car owner grabbed the suspect and held him until police arrived. Police arrested the suspect, a 23-year-old Enchanted Lake man, on suspicion of illegally entering a car. Police arrested a 24-year-old Kaneohe man early yesterday morning after he allegedly beat his live-in girlfriend over the last two weeks. The 23-year-old woman told police the boyfriend had assaulted her twice before on Sept. 20 and Friday. The man allegedly broke one of her lower front teeth after punching her in the mouth on Sept. 20, police said. Police found the suspect and arrested him at 1 a.m. yesterday at 45-480 Kaneohe Bay Drive on suspicion of second-degree assault and abuse of a household member. An 11-month-old Kona girl died yesterday after a 27-inch television fell on her, Big Island police said. Kona police identified the toddler as Janae Heath. The apparent accident happened about 11:44 a.m., while Heath was alone in the living room of her Lailani Apartments home in Kona. Her father and siblings were home, but in other rooms. They found the television on top of the girl, and called police. The infant was taken to Kona Community Hospital, where she was pronounced dead.